A Facebook page and a Twitter account do not make a social business. Truly social businesses are social inside and outside, and not merely using a few tools in isolation. Sadly, despite the proliferation of social media for years, very few companies are truly social businesses. 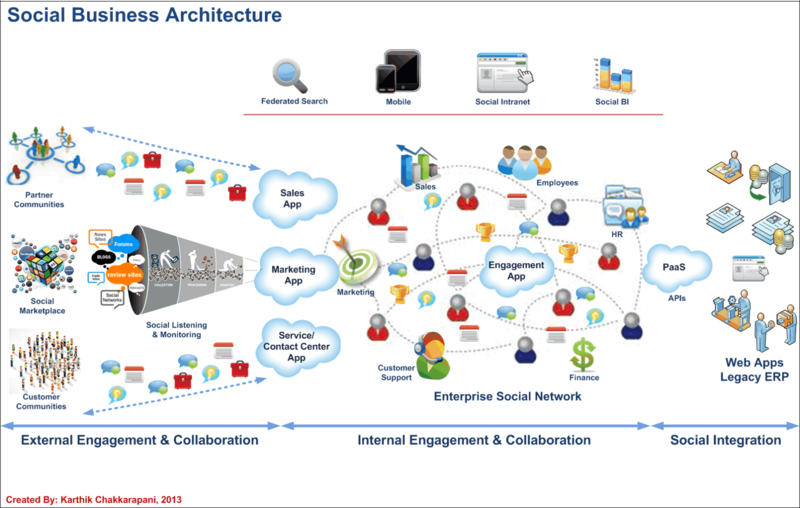 A true social business uses and adopts social media externally and internally – and especially inside. After all, no one really cares about corporate Facebook pages and Twitter accounts (when was the last time you sought out a company’s Facebook page, and read it, or followed a company on Twitter?) – these tools add little or no value to most organization’s social aspirations. Authentic social businesses find value in social collaboration at the executive level, and at the employee level, with direct interaction with customers and employees at multiple levels. If you’re using social media tools as simply another broadcast mechanism (98% of organizations), you’ve missed the boat. The hallmark of social media is dialogue – synchronous communications, collaboration and cooperation. Any communications manager can post sanitized PR messages to a blog or Twitter; the only blogs of value are those that are written and managed by people of authority (expertise), in their own words, and in a meaningful way that adds value to the lives of the reader (e.g. What do the annual results mean? Why are we expanding into Asia? Why did we close that plant in Ohio? (above and beyond the corporate press release). The corporate intranet is where a business truly becomes social. However, while the adoption of enterprise social media continues to grow, these tools continue to be poorly deployed and adopted, to the detriment of all. Executives are not happy, employees are not thrilled, and social media owners and managers are frustrated with their internal social business efforts. Social media tools such as blogs, wikis and other vehicles, are present on most corporate intranets: 71% have at least one social media tool available to some or all employees, according to the results of the State of the Social Intranet Study released this month (651 participants, conducted by Prescient Digital Media), but the execution and supporting change management required to make these tools effective is lacking, or absent. BUT… and it’s a big but, only 10% of the survey respondents have a truly social intranet (multiple tools woven into most aspects of internal content consumption with a visible home page presence). Even still, the satisfaction levels with these tools are pathetically low. The results reveal a darker, more pessimistic lining to the social business cause: most organizations are not truly social, just flirting with social. Many are playing with and even finding some success with a smattering of social tools, but using and integrating social media into most aspects of their day-to-day business – inside and outside the firewall – is still an evolutionary leap some years away for most. Part of the reason, is the lack of money or investment.